Your Clinical Health Coach | Helping to motivate you to live your life to the fullest! A personal story of care. . .
"I just didn’t feel good...I had been feeling this way for several years. My health was declining and no one could figure it out. I knew if I didn’t get to the bottom of it, I would no longer be walking this earth in a few years. I approached my doctor and she said, we will get to the bottom of this. She ran some tests and over four hours later she came in and announced 'You have diabetes.' I hugged her! I was joyful! Now I simply needed to learn how to live with this. 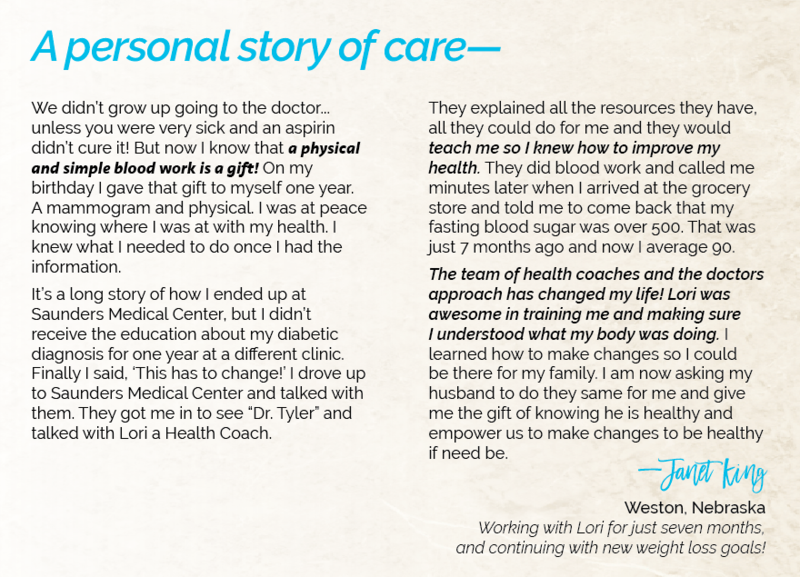 They introduced me to Judy, one of the clinical health coaches. Both Lori and Judy are such sweethearts. I worked with them to understand my disease. They helped me understand how to apply this to my life. I am the type of person that wants to know what will happen if I don’t do it. So I asked. They gave me the information I needed. I realized I needed to make changes. The coaches taught me to care for myself, in this new way. I now had the information I needed to make changes and live better. I have so much energy now! They are there for me anytime I need help along the way. The whole world opened up when I met Judy. Truly, they saved my life." For the full HEALTH COACHES brochure, click here!